Our Gleaning Program is based on strong partnerships with area farms in order to sustain reliable weekly distributions of fresh fruits and vegetables to food pantries and afterschool programs in Columbia and Dutchess Counties. 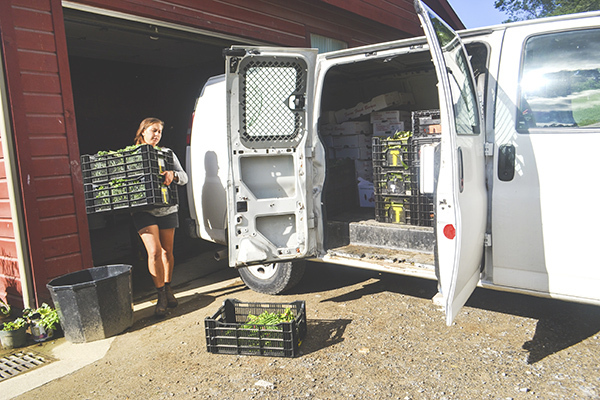 We work with over 40 farms both counties to pick-up already harvested produce from our partner farms every Monday and Tuesday, distributing to over 30 recipient sites on the same day to maintain peak freshness. The winter months have us gleaning more sporadically, with the occasional distribution of seconds storage vegetables. We launched the Gleaning Program in the late spring of 2016 which runs continuously from June through November each year. Our first year culminated in the redistribution of over 31,000 pounds of sustainably grown food from over 25 farms to 15 sites on a weekly basis. In 2017, we grew our program to work with 15 new farms and 16 new food pantries and after-school programs in both counties. In 2017 we gleaned 43,969 pounds of food, and 2018 had us gleaning 45,024 pounds. Over the last two years we have expanded our offerings to not only supply fresh vegetables and fruit, in addition to cheese, meat, and grains.